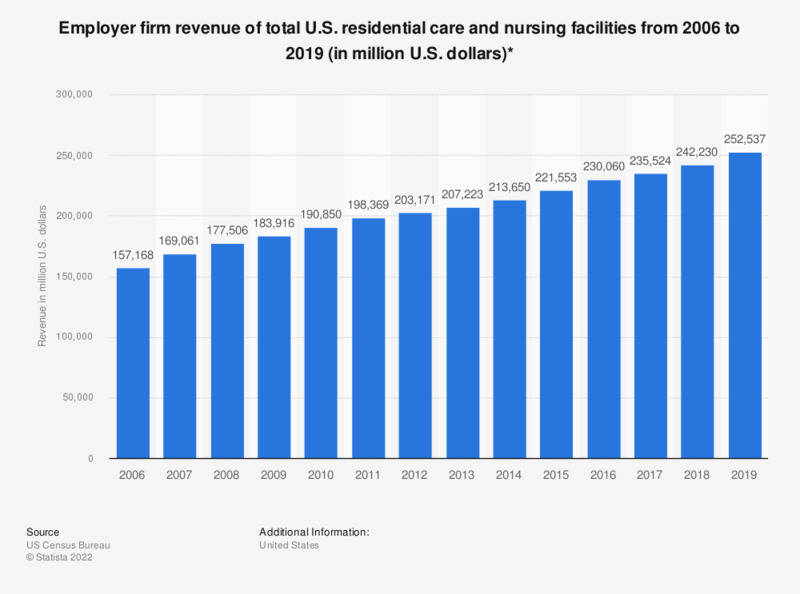 This statistic shows the estimated total employer firm revenue of nursing and residential care facilities in the United States, presented annually from 2006 to 2017. In 2017, the estimated employer firm revenue was almost 239 billion U.S. dollars. * Statistic includes: nursing care facilities (skilled nursing facilities), residential intellectual and developmental disability, mental health and substance abuse facilities, community care facilities for the elderly, and other residential care facilities. Estimates cover taxable and tax-exempt firms and are not adjusted for price changes. All values of each year represent totals of all revenue types: Medicare, Medicaid, other government (veterans, NIH, Indian affairs etc. ), worker's compensation, private insurance, patient (out-of-pocket), all other patient care sources not elsewhere classified, and non-patient care revenues.